Fishermen learn how to put on their immersion suits, part of the abandon-ship drill. Commercial fishing is one of the most hazardous occupations in the United States with a fatality rate 29 times higher than the national average for all occupations. According to the National Institute for Occupational Safety and Health, the greatest dangers to fishermen are vessel disasters, falls overboard and machinery on deck. To head off disasters for the 2018 commercial fishing season Julie Matweyou, associate professor in the College of Fisheries and Ocean Sciences at the University of Alaska Fairbanks, trained 30 commercial fishermen to conduct marine safety drills in Kodiak last month. 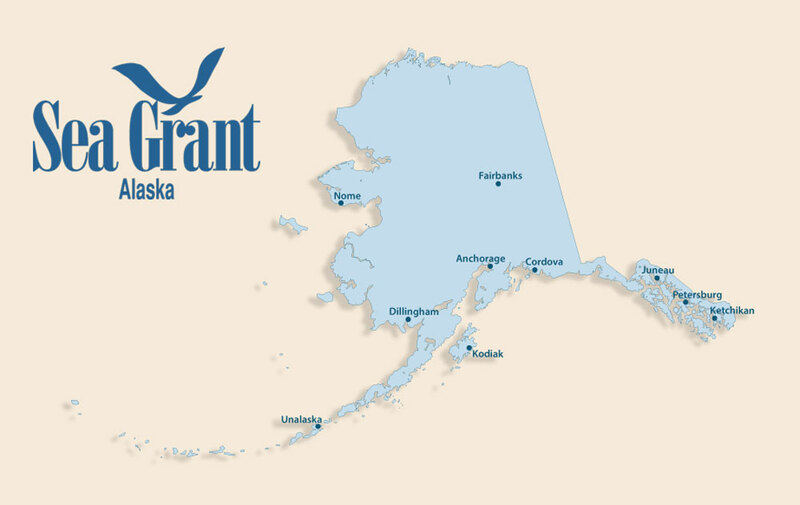 Matweyou is Alaska Sea Grant’s Marine Advisory agent in Kodiak. She and co-instructor Arthur Schultz are safety trainers for the Alaska Marine Safety Education Association (AMSEA). Alaska Sea Grant Marine Advisory agents train more than 70 fishermen each year to conduct onboard drills, improving the odds of survival for hundreds of Alaska fishermen and crew. Local partners for the Kodiak training sessions in May were the US Coast Guard Air Station Kodiak and Bayside Fire Volunteer Fire Department. Air Station Kodiak has sponsored base access and assisted Matweyou with instruction since 2012. “We are so lucky here in Kodiak to have access to the US Coast Guard base and to work one-on-one with the rescue swimmers. It is an honor and privilege to have Air Station Kodiak assist with pool and helicopter rescue skills, including using the dewatering pumps that will be delivered to vessels in flooding distress. The training is invaluable,” Matweyou said. Many US commercial fishing vessels are required to have a certified emergency drill conductor onboard to carry out monthly drills with crew. Training certificates issued to fishermen who completed Matweyou’s training have no expiration date, but NIOSH recommends all fishermen and crew retrain every three to five years to update their skills. During the two-day drill conductor training fishermen learned how to don immersion suits and life vests, abandon a vessel and launch and recover life rafts. They also were trained to rescue a person from the water, create signals and radio distress calls and fight fires. The award-winning book Beating the Odds: A Guide to Commercial Fishing Safety, an international marine safety manual published by Alaska Sea Grant, is given to all trainees who complete the AMSEA courses. Zipped into their immersion suits, trainees are ready for pool instruction. Tandem swimming exercise teaches sea survival.